A lot of things are going on for the princeling and I, and one of the things that happened was this: We turned too quickly to get into the rehab facility my dad is at, and ended up in the driveway for senior apartments over looking a pond/lake sort of thing. “Oh, I’d love to live here!” The princeling was all for it. Then we started talking and realized we both would love the same thing: An apartment or condo on the beach. I am not a house kind of person. I rent a room at my dad’s house, and I love living here…. but. Not so much right now. For one thing, he’s not here. We are definitely missing our Poppa. Hopefully he’ll be home soon. But also because of the actions of another person, who… I don’t know. To me, it seems as if they either didn’t want poppa to come home, or they wanted the princeling and I gone. Personally, I’m starting to think they just throw stuff out there, hoping it will stick to someone and take the spotlight off of their actions. Four people have a key to the house. I’m ok with that. I’m not okay with people coming in and complaining that the house is torn up, it’s horrible, it’s a mess. Yes, I keep my room a little messy. Yes, Ray’s room can get destroyed. He’s 9. And the doors shut. No one else needs to go into our rooms. However, in all the years I’ve been out on my own… Never has the public spaces in my home been too messy for anyone to visit. Anyone. When my brother came to check it out the first time, there were maybe 4 dishes in the sink. That’s it. I enjoy apartment living. I don’t want to have to fix plumbing or air conditioning. There is no way on God’s green earth that you want me taking care of a yard, lawn or otherwise. Thankfully, I didn’t kill off the grass completely, it’s coming back… but in my defense, the sprinkler system stopped working as if someone had unplugged it. Then the freezer went kaput. Thankfully, a neighbor came over and figured it out. Whew! A little reset button for one, and the power breaker for the other. The fuse box in an apartment is normally either in a closet, or in the kitchen. Apparently, here, it’s on the side of the house. There’s the cooking and cleaning, which is fine, I get it. Nothing more than what I’d have on my own in an apartment. However, if I was in my own place, my very home would not be in jeopardy because of someone else’s lies about my housekeeping. Right now, I have a pit in my stomach because there are 4 cups in the sink and a few spoons, a fork and a knife. That’s not right– the house is not a mess. It looks like someone lives here… but we do! We live here! But I’m ok. The great thing about smart phones is that you can record stuff with a time and date stamp. So for the past week I’ve been making a video of the house then texting it to my dad and my brother’s wife. Because yah, it got to that point. And it’s sickening to think that someone would be that low. Especially when anyone around us can tell that one of the reason’s my dad is fighting so hard to come home is because of that little boy. Both of their faces light up when they see each other, and my son is definitely the star of the show. But the star of the show told Poppa on Saturday that he and I were working on a Tiny Home Dream. I explained to poppa that it would be 5 to 10 years away… but yes. The goal is my son and I, in a tiny home, where we will not have to live wondering what a certain person has said about us this day. PS- I’m happy to report that the power bill was less than normal! Part of the reason is that I turn off the air when I leave. Even on the days when it hit 1-5. the house was only 85. Turn it on when I got home… BOOM. At least I won that one! Later in the week, I plan to catch you all up on what we’re up to. Yes, I said we! I’m part of a writing group now, and I’m actually getting a bit prolific. I know I’ve been gone from here for a while, but I’m writing, it’s good… and you know what? It’s enjoyable! It’s fun! First off, I need to apologize. I have been a bad blogger. I should have been over here beating the drum for my blog post over at the Mocha Memoirs blog (but I will be on there every month on the 10th! check it out!). One of those things was a co-worked who became gravely ill while at work. Our thoughts and prayers are with him, and I hope he makes a full recovery. It might be a long road, though. 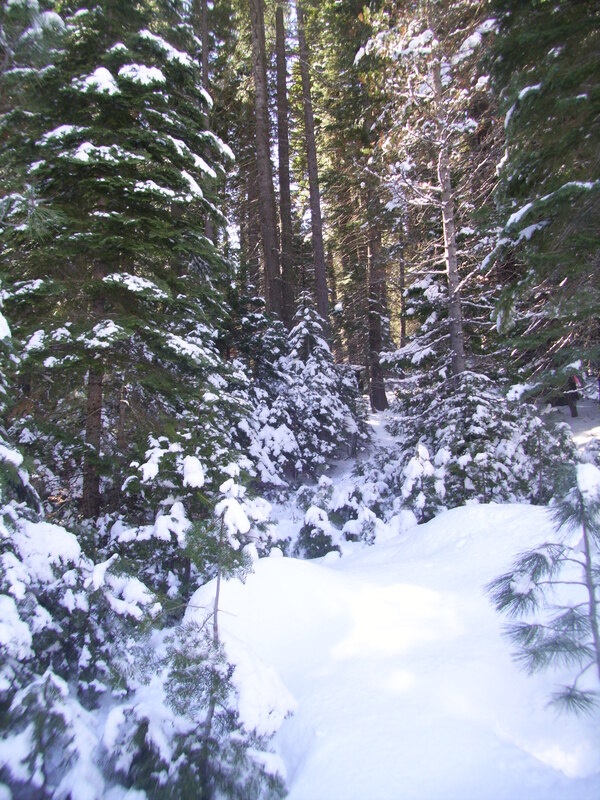 Saturday, Linda took Ray and I to the snow. I hung out, watched Ray playing in it. Watched Teagon throw a fit when people were paying attention. But I also just soaked it in. 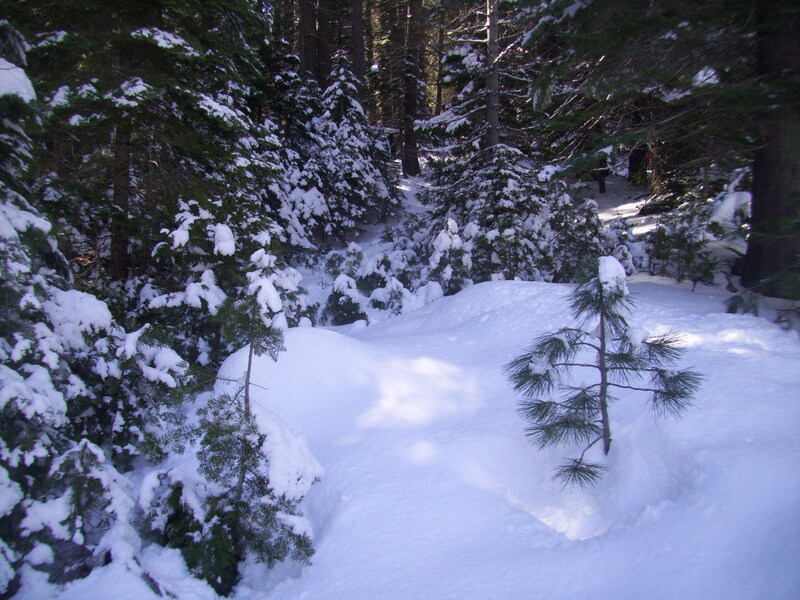 I haven’t been in the snow, not like this, since I was a preteen maybe? These two remind me of a Robert Frost poem. Can you believe this was taken in California in March? Crazy! 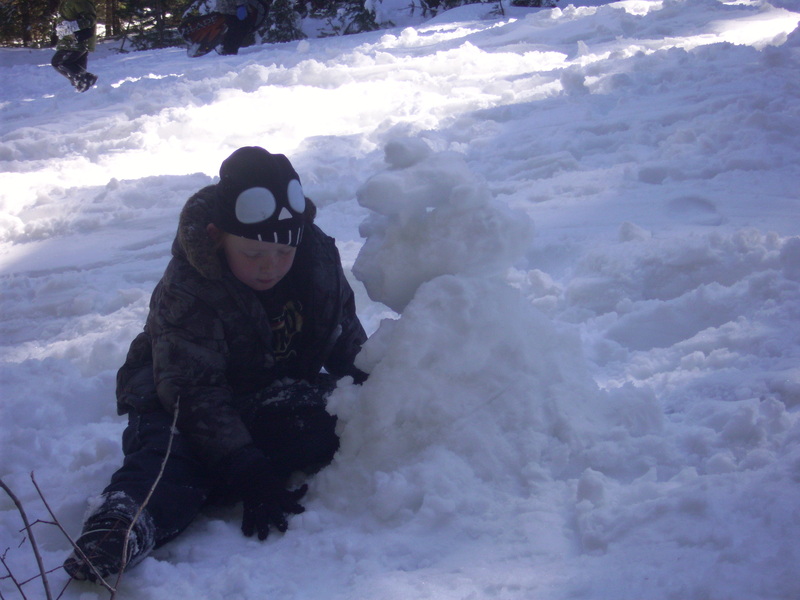 My son, I couldn’t see it at the time… but apparently he was makeing a snow teddy bear! Of course he had a blast, and it was so awe inspiring to see him experience it for the first time. He was soaked by the time we left. I was kind of worried because of the Dyspraxia– his motor skills and right and left are a little off. However, he took to sledding like a pro. He got one push off, and he was off! By the time we left, he was falling almost every other step. At that point, his brain needs a break as well as his body. Sunday he had a fever of 102.9 He apparently brought the stomache flu home from school. Great. Today, Tuesday, he’s feeling much better. Fever broke sometime yesterday, and today he’s been full of wanting to play play play. I did read Beautiful Creatures while on sick child duty— they do sleep alot hehehe. So I will be back probably Thursday with a review on that. Oh. And go over to the Mocha Memoirs Press blog (i even linked it very nicely for you over there on the side) and check out the outher awesome writers who are going to be blogging on a monthly basis. Hopefully, things will settle back down. Work of course is stressful, but I’ve always been really good at leaving work at work. The worry for the co-worker doesn’t count, though, and he prognosis is optimistic. Of course, what else could a Polly Anna say? But it is cautiously optimistic. I think I’m going to go hug my son. See you all on Thursday. Have any of you read Beautiful Creatures yet ?Have to say, was not what I was expecting at all! WHY OH WHY do people give you excuse (lie) after excuse (lie) on why they can’t do something, then get mad when you have beat down their excuses (lies)? And they’re mad at you! Especially when all they would have to do is tell the truth. 1 time, no backpedaling, nothing to remember… The truth shall set you free and make it so that you don’t get people irked at you. I was so upset, I accidentally took a big old slurp of Ray’s chocolate mile. Which wouldn’t be a bad thing, except that I accidentally bought him sugar free chocolate sauce. And I have a severe sensitivity to fake sugar. Apparently, it’s very close to chlorine (chemically speaking) and my body just can’t tolerate it. Thankfully, the sauce only had Splenda and the other semi-not-too-bad one. The one that gives me a fierce headache but NOT the migrane, sick, I need to passout headache that nutrasweet gives me. It’s been a rough night. And I can still taste metal on the back of my tongue. That can’t be good, can it? BUT— One good thing. I was laying down with Ray, and I said something about my head hurt. Zillions little boy kisses all over Mommy’s face and head, making her all better again. Love you, Buddy Boy! Four of my closest friends live either out of state or out of country. You know who you are, and for these purposes, you are officially “off the hook.” But I will say I love you, my peeps. And I miss you more than I can say. Although I’ll probably get pretty darned close. But then there are those that are close. And yet still, I don’t talk with them. See them. Nada. I have one friend, B, who I see & talk with on a weekly basis. We used to see eachother every single day– watch Buffy together, even. That was when we lived in the same apartment complex. R and I… we used to see eachother all the time, too, before she moved oos (out of state). I’m used to having at least one friend that I can talk to all the time. Don’t really have that right now. I’m at loose ends. Even my dad, my 83 year old dad has a social life. Tried to call him tonight– nope. He was not in. SIGH. (Although I am very happy for him). Even though I had vowed I was done trying, I picked up the phone to call one friend tonight. Got voice mail. Don’t know why I bothered leaving one, I won’t get a call back. And I’m off into the viscous cycle. You know, I was ready to not have time for friends because Ray needed me. I was. I was going to spend time with him, have fun, do this do that… And then it turns out that the developmental problems may not be as large as some thought. Now that the fight is over, so too is the need for over protection and making sure things go right for him. There’s still some level of fingers in the pie, especially with school… But no where near where I thought it might be this time last year. Now, he’s all gang busters making friends and being a “love” to his teacher. Brian has classes 2 nights a week. Then there’s Bible Study on Monday, too. He loves Bible study, comes home all a-glow with the warmth of seeing friends and studying with them. How can I tell him NOT to go? Can’t. It didn’t hurt so much, or feel so bad when I was at Dad’s because Dad is as social a creature as I am. Just enough to be connected, but leave me alone when I want to read. Brian, not so much a talker. Which is fine, I guess. I mean, I married the man knowing this. I’m just feeling lost. Unfriended, as if there was a poll and everyone decided to get rid of me. Isolated. Sorry for myself. So here i am, throwing it all out there to the world. Lets face it, a blog is a connection of sorts. The act of reading this blog opens the possibility of a dialogue. Or you know. I could get off line, pick up the phone, and try again. Right after I hit “Publish”. Just said goodbye– dropped him off and waited long after he’d faded into the system. “This is it,” I told him, tell myself. “Once this is done, your past is behind you. That Brian no longer exists. Lay him to rest while you’re there.” Easy to say, harder to live by. That’s why I’m hiding. Hiding at Denny’s, of all places. Somewhere where no one knows me, really cares if my eyes fill with tears. Which is why they won’t. I do not cry in public if I can help it. Instead, I gather my resolve, put pen to paper and let it out. No one knows or cares about what someone else is scribbling across the back of their check stub. This is merely the warm up. Tonight, the real show begins. The Mommy & Ray show starts playing again. And no mis-cues can be tolerated. The sakes are too high. And yet, still, in this particular situation, I am the lucky one. Because I was able to witness Ray’s conversation with the moon last night. I was so proud of myself yesterday. I wrote 3 pages. Yahoo! Not sure if it will be a short story, or just a character study, but I had a great day! I was proud of myself, and of the three pages. I got called back into work. The joy just kind of got sucked out of my life today. Hopefully tomorrow will be different. Because I don’t want to be that person that allows another person in a pissy mood to ruin my day. I hate being that girl, being that “sensitive”. So the goal is to find the joy.